Today, we welcome back the always delightful Jodi Thomas! 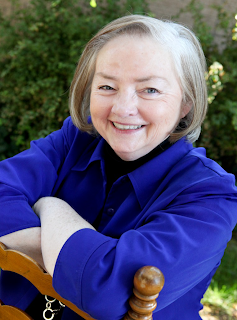 Jodi is the NY Times and USA Today bestselling author of 37 novels and 11 short story collections. She is a fifth generation Texan who chooses to set the majority of her books in her home state. And who doesn't love the great state of Texas as a setting?! 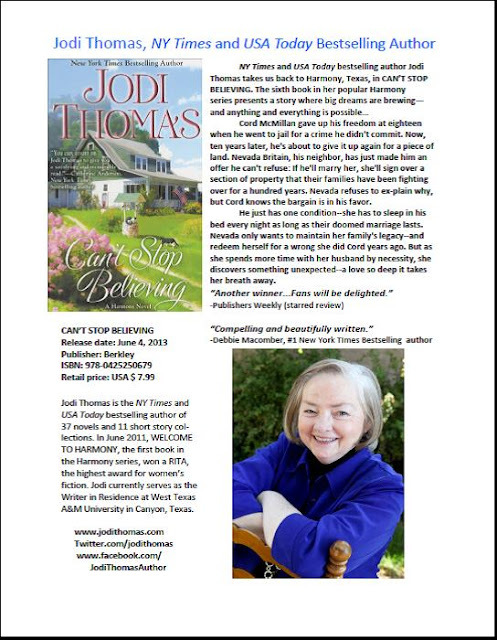 Her latest, CAN'T STOP BELIEVING, is on shelves now and was reviewed here by the lovely Janga. Take it away, Jodi! From the day I started writing CAN’T STOP BELIEVING, I felt like I was surrounded by people I could love. These characters walked off the pages and said hello. I had to laugh when Martha Q, a widow seven times married, forms a writing group and then decides to help folks out whether they want it or not. I cried when Ronny first sees a love she thought she’d lost. And I fell in love with Cord and Nevada as they fought their way through all the baggage they both carried to find something worth keeping. People often ask me where my characters come from. In truth, I don’t feel like I make them up. I feel more like they sit down across the desk and talk to me as I write. They tell me the story and some nights I stay up longer to get it all down. Cord McMillan stopped my heart when I first saw him. He was a man trying to stand tall even after life had done its best to knock him down. He doesn’t think he has a friend in the world and every time someone shows him a kindness, he pays it back double. He can’t believe it when his rich, spoiled neighbor offers a bargain he can’t turn down. He offers her the one thing she can’t buy, honesty. CAN’T STOP BELIEVING will warm your heart. The people of Harmony will stay with you long after you finish reading. Come along with me into a story that will make you laugh and cry and fall in love for the first time, for the last time, forever. I just started this book today...I love it so far I should say I love all Jodi's books... Kepp them coming! Glad to hear it, Donna! Blue-Eyed Devil by Lisa Kleypas is the last book I remember that had me in tears. It had me in tears, too, Maureen. Such a good book! I am a Harmony devotee. I always enjoy my visits there. I loved Can't Stop Believing and eagerly await the next book. Recent reads that moved me to laughter and tears were Once Upon a Tower by Eloisa James, Any Duchess Will Do by Tessa Dare, and It Happened One Midnight by Julie Anne Long. Anne Gracie's books always have that effect. I've yet to read Anne Gracie, Janga. It sounds like I need to read her books! That is a tough one - Home Again (Kristan Hannah) and Three Wishes by Barbara Delinsky had me balling my eyes out. Any of Shannon Stacey's Kowalski series had me laughing with the dialogue - same for The Pregnancy Test by Erin McCarthy. I love this series and would be thrilled to win a copy. Oh, thanks for the recs, Pat! And good luck! Elizabeth Lowell makes me cry. Her heroes are hard to like and sometimes extremely mean but when they fall in love tears fall. Elizabeth Hoyt with her broken soldier heroes. I totally agree with you about that Elizabeth Hoyt series, Laurie. What the heroes went through...whew. I agree with you about Nicholas Sparks, LS. I guess I need to read Shannon Stacey! I have to admit, I don't cry often over books. But JoJo Moyes's Me Before You did make me cry and laugh. I love Jodi's Harmony series and am so looking forward to going back for a visit in Can't Stop Believing. Thanks for the post and giveaway. I'll have to look that one up, LSUReader. Jo Goodman is a writer that has made me both laugh and cry. I am just horrible at remembering titles but laughing/crying from the same story are definitely my favorite type of reads. It means it totally got to me emotionally. I love it when it makes me lol or brings me to tears. When it involves all your emotions, it is a good read! I love a book that makes me laugh and cry. I can't remember any specific titles right now. I adore Jodi's books they are always great. Glad to hear it, Martha! Janice, I read Gone with the Wind a long time ago, but you are absolutely right! It certainly engages ALL emotions. The Blue Ribbon Jalapino Society by Carolyn Brown. Some funny, quirky characters, but also some emotional moments. That one sounds like a lot of fun, Sharlene! I am sorry to say I can't remember the last time a book made me laugh and cry. Its been a while and I can't remember the name of it. I know when I read one like that I think its just awesome. Thanks for stopping by, Quilt Lady! Laugh and cry? ONCE UPON A TOWER by Eloisa James. Such a good book! Toughie - both laugh and cry - cannot think of one but Nicholas Spark ALWAYS makes me cry - The Notebook and Message in a Bottle - used a lot of tissues. Jill Shalvis' books always make me laugh. The last book I read that made me both laugh and cry was Blowing On Dandelions by Miralee Ferrell. It was an awesome book. I love books that can pull at all your emotions. This book sounds great too. I'd love to read it. Thank you for the chance! hmmm ... I'm laughing as I read Susan Mallery's 'Under Her Skin' - I love some her quirky characters and their funny comments. I do tear up sometimes with sad aspects of stories, but can't remember a specific time recently. I love these series about small towns. Definitely my kind of book. Life is never a smooth road and there are detours and potholes we never expect. I love it when an authors writes characters and stories that reflect this. There is not always a happy ending in real life, but that is what fiction is for, to provide us with the happy endings we need every once in a while. I wish I hadn't gotten behind in keeping a log of all the books I read. I know I read a book last month that had me weeping while I read it (and trying not to let my husband notice). I am reorganizing my library, so my stack of recently read books isn't where it should be. It was not a forgettable book, I have just read too many since then to remember. I know it is in the pile somewhere and will end up on my keeper shelf.